This article is about the Ice Climbers' appearance in Super Smash Bros. Ultimate. For the character in other contexts, see Ice Climbers. The Ice Climbers (アイスクライマー, Ice Climber) are playable characters in Super Smash Bros. Ultimate. They were confirmed on June 12th, 2018. The Ice Climbers are classified as fighter #15. 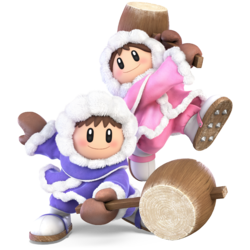 The Ice Climbers are once again voiced by Sanae Kobayashi, with her portrayal from Brawl being repurposed for Ultimate. Play VS. matches, with the Ice Climbers being the 10th character to be unlocked. Clear Classic Mode with Link or any character in his unlock tree, being the second character unlocked after King K. Rool. Have the Ice Climbers join the player's party in World of Light. With the exception of the third method, the Ice Climbers must then be defeated on Summit. Previously, the Ice Climbers were known for having some of the most infamously powerful damage racking capabilities thanks to their ability to wobble in Melee and infinite chain grab in Brawl, and additionally achieve a KO from them. Possibly as a result of this, in the transition from Brawl to Ultimate, the Ice Climbers were significantly nerfed. Their grab game was significantly impacted the most; the partner climber can no longer grab or act when the leader is grabbed or throwing someone (except when in the air), the leader's grabs have more lag, and their infamous chain grabs were removed. Outside of this, the Ice Climbers have received a mixed bag. On the nerf side, the base damage output on many of their moves has decreased and many of their attacks connect less reliably when they are together due to reduced hitlag. The partner climber also no longer performs Blizzard behind the leader when used on the ground and Blizzard itself is less effective as a spacing tool due to it being almost useless when used at max range as well as it having increased ending lag. The partner climber is also launched much easier than the leader due to taking increased damage and knockback from attacks, and the AI's intelligence has been reduced leading to more likely self-destructs, making it harder for each of them to stay together. Finally, due to changes in Belay's hitboxes, the move can gain significantly less height if the hitbox is out prioritized, and its overall size is smaller, making it harder to connect against grounded opponents. On the buff side of things, as with almost every other returning veteran, their mobility has been considerably increased and the partner climber is now faster than the leader, making it harder to separate them. Some of their moves, including forward smash, down smash, and forward aerial have higher damage and KO power, and the Ice Climbers have superior combo potential due to the removal of hitstun canceling and the weakening of SDI. This is further complimented by the fact that desynching remains a very powerful tool that gives the Ice Climbers highly effective combos. Thanks to improved freezing properties, the Ice Climbers can freeze opponents easier and longer, which can lead to high damage, KOs while edge-guarding, shield pressure, and follow-ups if performed correctly. Nevertheless, the Ice Climbers are significantly less effective than in Brawl, although to what extent is unknown, especially since they are difficult to play at a high level and it is unknown how far their desync combos can be developed and be applied into competitive matches. Both Ice Climbers always face the screen regardless which direction either of them turn, making both their stances mirrored. The Ice Climbers gain additional detail due to the game's graphical improvements. The duo now wear coats with detailed furry lining, and their boots and hammers are covered in powdered snow. They have slightly smaller heads, and the proportions of their facial features and bodies have also been adjusted. Like other fighters, the partner climber is more expressive than ever before. They cheer the leader on when they throw an opponent, and panic in place when they are grabbed or stunned. They will also have a panicked or hurt expression whenever one of the climbers is hurt normally, frozen, buried, or stunned (e.g., Popo or Nana gets hurt alone and one watches when they aren't grabbed). Either Ice Climber now hangs onto the ledge with one hand instead of two. Sidestep animation has been altered, showing them resting their hammers on their shoulder while looking back. The Ice Climbers have a new idle pose of them turning to look behind themselves. It replaces the animation of them dropping their hammers then lifting them back up. The Ice Climbers only jump once when using up taunt as opposed to three times. Their victory theme has been shortened to only contain the second half. In the end of a solo match, only the leading Ice Climber will be shown inside the losing pane on the results screen. Both Ice Climbers are still shown if the match ends in a No Contest. Nana's crowd chant is no longer the back sound of the menu if she is currently the leader. Like all characters, both of the Ice Climbers' jumpsquat animations now take three frames to complete (down from 4). The partner climber is now generally faster than the leader. This helps them keep up if the two are separated. This, however, makes desyncing slightly more difficult. The partner climber now takes 1.05x times the damage and knockback from attacks, making them slightly easier to separate and KO. This additional knockback also affects the leader if both climbers are hit with an attack which deals vertical knockback, significantly hindering the Climbers' vertical endurance when they are together. The Ice Climbers walk faster (0.96 → 1.008 (leader), 1.1088 (partner)). The Ice Climbers dash faster (1.388 → 1.53 (leader), 1.683 (partner)). Their initial dash is also faster (1.4 → 1.68). The Ice Climbers' air speed is faster (0.7708 → 0.83 (leader), 0.8715 (partner)). The Ice Climbers' falling speed is faster (1.2 → 1.3). The Ice Climbers' gravity is slightly higher (0.077 → 0.082) although it is lower relative to the cast. As with all returning veterans, the Ice Climbers have much higher traction (0.035 → 0.077) although it is still the second lowest in the game. The partner climber has higher air acceleration (0.09 → 0.0945). The removal of chain grabbing hinders the Ice Climbers more than any other character, as it harshly reduces their damage racking and KO abilities. The partner climber's AI is worse as they have more difficulty recovering and making it back to the leader which can lead to them self destructing. The duration enemies are frozen from the Ice Climbers' ice attacks are much longer, allowing for easier unavoidable followups at high percentages. At very high percentages, it can even freeze them long enough to be unable to recover from near the ledge. Ice Climbers arguably benefit the most from the reintroduction of wavedashing because of their very low traction, significantly increasing their approach and mobility, as well as giving them more mixups with grabbing and attacking opponents. The partner climber's attacks now affect the duo's staleness queue; in previous games, they would use the queue but could not alter it. This generally means that the duo's attacks will both stale and refresh twice as quickly. Neutral attack can now lock opponents and the partner's second hit deals more damage (2% → 2.6%). Neutral attack does less damage (3% → 2% (leader hit 1), 4% → 3.5% (leader hit 2), 2% → 1.5% (partner hit 1), 11% (9.6% (total)). Second hit of neutral attack has more ending lag (frame 20 → 30) and both hits have a shorter duration (frames 4-7 (hit 1), 4-6 (hit 2) → 4-5 (both)). The partner's forward tilt deals less damage (7% (non angled), 9% (angled) → 6.75%). Forward tilt has a shorter duration (frames 9-12 → 9-10). The final hit of up tilt has a longer duration (frame 23 → 24-27) and has more combo potential due to the removal of hitstun canceling. Up tilt deals less damage (1% (loop hits) → 0.8% (leader loop hits), 0.6% (partner loop hits), 17% → 15.4% (total)) and the final hit has more startup lag (frame 23 → 24). The partner's down tilt now deals consistent damage (4%/5% → 4.5%) making it deal more damage at close range but makes it deal less damage at the tip of the hammer. Down tilt connects less reliably at higher percents when both climbers are present. The partner's dash attack deals more damage (4% → 4.5%) and dash attack has a longer duration (frames 11-12 → 11-14). Dash attack causes less hitlag making it connect far less reliably at higher percents when both climbers are present. Forward smash has less startup lag with a longer duration (frames 12-13 → 11-13). It also has less ending lag (frame 49 → 47) and deals much more knockback. Forward smash has an altered animation with less range and no longer has a sweetspot which deals more damage (13% → 12% (leader), 10% → 9% (partner), 23% → 21% (both)). Up smash has less startup lag (frame 13 → 12) and no longer has sourspots. The partner's up smash deals less damage (9% → 8.2%) and it has more ending lag (frame 48 → 50). Down smash is now a sweep that hits one side. The partner will use the same attack facing the other way. Down smash covers more horizontal ground when together and it deals more damage (12%/10% → 13% (leader), 9%/8% → 9.7% (partner)). It also has less ending lag (frame 44 → 41) and has more KO potential. Down smash only hits on one side when solo. It is also drastically harder to connect with both climbers and even if it does, its maximum damage output is much lower as it no longer has two hits (42% → 22.7% (both)). All aerials have less landing lag (15 frames → 7 (neutral/back), 20 frames → 10 (forward), 30 frames → 14 (up), 42 frames → 20 (down). The Ice Climbers can no longer use two back or up aerials in a short hop due to their faster falling speed as well as the latter having increased ending lag. The partner's neutral aerial deals more damage (5% → 5.2%). Neutral aerial connects less reliably when both climbers are present especially at higher percents. The partner's sourspot forward aerial deals more damage (7% → 9%) improving its KO potential when both climbers are present. The removal of meteor canceling also improves the sweetspot's reliability. Back aerial deals less damage (11% → 10% (leader), 8% → 7.5% (partner), 19% → 17.5% (both)) and connects less reliably when both climbers are present especially at higher percents. The Ice Climbers have a new up aerial: an upwards hammer swing in a horizontal arc. Compared to the old up aerial, it provides much more horizontal range and hits in front of them, covering them more efficiently than before. New up aerial deals less damage (10%/9% → 9% (leader), 7%/6% → 5.75% (partner)), has more startup lag, a shorter duration (frames 6-23 → 7-11) and more ending lag (frame 30 → 36) compared to the previous one. It also has less vertical range making it much harder to connect against grounded opponents. The partner's down aerial deals more damage (5% → 6%). Down aerial also auto-cancels earlier (frame 58 → 54). The Ice Climbers now bounce up before performing down aerial similar to Sheik's down aerial. Down aerial has more startup lag with a shorter duration (frames 9-51 → 12-51). Grabs have more startup (frame 6 → 8 (standing), frame 8 → 10 (dash/pivot)) and ending lag (frame 30 → 40 (standing), frame 40 → 48 (dash), frame 40 → 41 (pivot)). The partner climber cannot act while the leader is held by an opponent's grab while on the ground, and enters a panicking animation instead. The partner climber can no longer grab, and will taunt during the leader's throw while on the ground. This removes their chain grabs and locks the Ice Climbers were infamous for in previous titles. Up throw deals more damage (6% → 8%). Down throw now has the leader grab the opponent with both hands, lift them up in the air, and slam them on the ground. The changes to hitstun canceling improve down throw's combo potential beyond lower percents with a solo climber. The removal of chain grabbing hinders down throw's damage racking potential at lower percents even with a solo climber. The leader's front and back floor attacks deals more damage (6% → 7%). The partner's floor attacks deals less damage (6% → 5.2% (front & back), 5% → 3.5% (trip)). Ledge attack is now a horizontal swing similar to their old over 100% ledge attack. It deals consistent damage compared to the previous two ledge attacks but the partner's ledge attack is now weaker (8% (hammer), 6% (body) → 8% (leader), 6% (partner). New ledge attack deals less damage compared to their old over 100% ledge attack (10% (hammer), 8% (body) → 8% (leader), 6% (body)) and the Ice climbers do not hunch over when performing it making them easier to hit. Ice shot deals more damage (1%-3% → 2-2%-3.5%) and it has regained a hammer hitbox. It also has less ending lag (frame 60 → 56). Ice shot can function as a projectile blocker since the sliding ice pieces won't get destroyed by any projectiles, and will cancel them out no matter how powerful they are. However, they do get reflected back if hit. But this is usually a much better consequence versus getting hit by the original projectile. Ice shot makes a different sound effect. Ice Shot has more startup lag (frame 17 → 18) and now damages the Ice Climbers when it's reflected back by a normal attack. Performing Squall Hammer solo now ends with a stronger hit that deals mild diagonal damage and knockback. The move also has less startup lag (frame 12 → 10). Desynced Squall Hammer can be used to trap opponents between both Ice Climbers. Squall Hammer now makes a twinkling sound effect when used. Squall Hammer grants much less vertical distance with mashing and it has more ending lag with both climbers (frame 70 → 78). Squall Hammer doesn't auto grab the ledge anymore. Belay covers slightly more distance with a solo climber and the solo climber has more control while using it. When both climbers are present, the solo climber covers more vertical distance but less horizontal. Belay now has unique sound effects once used rather than their regular jump sound, presumably taken from their original game Ice Climber. The partner's hitbox on Belay can be out prioritized. If it is, then the leader will rise no higher than when the move is done solo. Belay has a smaller hitbox making it harder to land against grounded opponents. Both Ice Climbers aim Blizzard forward while on the ground, similarly to their aerial version in previous games. This increases its damage output when used on the ground, but means that Blizzard can no longer hit opponents behind them hindering its spacing potential. Blizzard freezes opponents for a longer period of time. Blizzard deals less damage at close range (2% → 1.7%) and it has more ending lag (frame 80 → 85). It also no longer causes hitstun or freezes opponent when used at far range removing its ability to lock and hindering its spacing potential. Iceberg now spins and features a teetering Polar Bear that launches opponents with greater knockback. During the move, a Condor will circle around the top of the screen, which the Ice Climbers can grab onto, and it will also deal damage to opponents that touch it. When paired, the Ice Climbers no longer make a "clapping" sound upon activating Iceberg. Iceberg lasts a shorter duration. This makes it less threatening to opponents, but also makes it less likely to lose the partner climber. Iceberg can now be moved across the stage. Iceberg no longer freezes opponents. Iceberg no longer causes platforms to damage opponents. Ice Climbers have been affected in the 1.2.0 update. The partner Ice Climber's AI has been improved: the partner will now follow the main climber better. This makes some desyncs harder to perform. The ledgegrab-box for Belay is larger. Iceberg via the FS Meter deals more knockback. Although the Ice Climbers have among the lowest traction in the game, their traction is completely unaffected by slippery terrain such as ice. The partner Ice Climber will taunt whenever the leader throws an opponent. partner: 1.5% The Ice Climbers swing their hammers horizontally, and then vertically. The Ice Climbers swing their hammers horizontally. partner: 0.6% (hits 1 - 6), 3% (hit 7) The Ice Climbers twirl their hammers over their heads. This creates a lingering hitbox that hits multiple times. partner: 4.5% The Ice Climbers sweep their hammers across the ground in front of themselves. partner: 4.5% The Ice Climbers leap forward, swinging their hammers in front of themselves. partner: 9% An overhead swing of their hammers, smashing them in front of themselves. partner: 8.2% The Ice Climbers swing their hammers in an overhead arc. partner: 9.7% The Ice Climbers sweep their hammers across the ground in a specific direction (the leader attacks in front, while the partner attacks behind). If the partner is absent, however, this move will only hit on one side. partner: 5.2% The Ice Climbers spin in place with their hammers outstretched. partner: 12% (sweetspot), 9% (sourspot) The Ice Climbers perform a somersaulting overhead swing of their hammers in a manner similar to their forward smash. The partner's hammer has a sweetspot that can meteor smash opponents. partner: 7.5% The Ice Climbers swing their hammers horizontally behind themselves. partner: 6.7% The Ice Climbers swing their hammers above themselves in an arc. partner: 6% The Ice Climbers hold their hammers below themselves and fall downward. A stall-then-fall, but what sets it apart from other down air stall-then-falls is that the startup doesn't possess a meteor hitbox. — The leader reaches in front of themself with their free hand. 1% A headbutt. The partner takes no action at all. 3% (hit), 5% (throw) The leader knocks the opponent away with their hammer. 6% The leader throws the opponent behind themself. 3% (hit), 5% (throw) The leader tosses the opponent upward and hits them with their hammer. 6% The leader lifts the opponent over their head with both hands and slams them on the ground. partner: 5.2% The Ice Climbers swing their hammers around themselves as they get up. partner: 5.2% Same as the frontal floor attack. partner: 3.5% Gets up and spins around, hitting with their hammers. partner: 6% The Ice Climbers climb up and slam their hammers in front of themselves. Ice Shot 3.5~2.2% (ice chunks), 3.5% (hammers) Each Ice Climber summons a small stalagmite of ice and hits it with their hammer, causing it to slide along the ground, gradually shrinking as it travels. It bounces off walls and shields. If attacked by an opponent, the ice will hurt the Ice Climbers. The ice can freeze opponents at high percents. Squall Hammer both: 2.2% (loop), 4% (final) The Ice Climbers stand back-to-back while spinning around an axis with their hammers outstretched, hitting opponents multiple times. The attack is concluded with them swinging their hammers upward, which launches opponents away. By repeatedly tapping the special move button, the Ice Climbers will rise in the air, allowing them to recover. This, however, also renders them helpless. If only one Climber is present, the move deals less damage and reduced knockback, and gains less height. Belay 16% (partner) The leading Ice Climber throws the partner the air with a rope. The partner then pulls the leader upwards. If there is a nearby edge, the partner will target it, and then proceed to pull the leader to the ledge as well. While rising, the partner is invincible, allowing for a safe recovery for both Ice Climbers. Each Ice Climber becomes helpless after the move is used. Blizzard both: 1% (far loop), 1.7% (close loop) The Ice Climbers blow a gust of cold air in front of themselves, potentially freezing opponents. If used on an already frozen opponent, they will remain frozen for slightly longer. With both Ice Climbers present, this move can deal a maximum of 31.5%. Iceberg 13% (peak, rising), 11%/9%/7% (iceberg), 16% (Polar Bear), 5% (Condor) The Ice Climbers summon a rotating iceberg to rise up from the center of the stage. For the duration of the Final Smash, it can be moved left and right. The range of how far it can move is shown by the mist. The iceberg deals damage to opponents who touch it: the closer they are towards the top, the more damage they take. Towards the base of the iceberg is a Polar Bear, which has high launching power. A Condor also appears, flying above, which the Ice Climbers can grab onto. This allows the iceberg to be more easily controlled without worry of self destruction, although the partner will be at risk of potentially being pushed offstage if they fail to grab it. Upon ending, the iceberg will lower itself, and the Condor will fly off to the side of the stage. The Condor flies in with them hanging off its feet. They then jump off while high fiving each other, and the Condor flies off. Up taunt: They set down their hammers and jump up and down once. In the Ice Climber NES game, this is the victory celebration of the Ice Climbers during the results screen (albeit without the flag). Side taunt: They will point their hammers diagonally upward shout "Yup! ", as wind blows behind them. Down taunt: They dance in a circle. Both nod and high five one another. Both jump up and down (their victory pose from Ice Climber). The partner climber hides behind the leader, only showing their face as the leader shifts from left to right. The second half of the track that plays when Popo or Nana grab the feet of the Condor at the end of a bonus stage in Ice Climber. The Ice Climbers fight two characters from a given universe in each stage. 6 Mario and Peach Princess Peach's Castle Main Theme - New Super Mario Bros. Although the Ice Climbers do not appear in the World of Light opening cutscene, they were vaporized and later imprisoned alongside the rest of the fighters (sans Kirby) when Galeem unleashed his beams of light. The Ice Climbers are unlocked in the southern portion of the snowy mountain area. Unlocking them eliminates the ice paths so they can be traversed in both directions as well as opening a path to the hidden forest. The Ice Climbers' Fighter Spirit can be obtained by completing Classic Mode. It is also available periodically for purchase in the shop for 500 coins. Unlocking the Ice Climbers in World of Light allows the player to preview the spirit below in the Spirit List under the name "???". As a Fighter Spirit, it cannot be used in Spirit Battles and is purely aesthetic. Each Fighter Spirit has an alternate version that replaces them with their artwork in Ultimate. Freezie Mario Bros. Series •Ice Climbers Grab 1,600 Mario Bros. (Battlefield form) •Item: Freezie •The enemy starts the battle with a Freezie Mario Bros.
Nana becomes the leading, player-controlled character when using the 5th, 6th, 7th, and 8th costumes shown below. The stock icons and character select portraits change to reflect this. Popo and Nana act separately in terms of their costume's color. Attacking a Metroid with Blizzard on Final Destination. Nana grabbed by the Arcade Bunny's claw on Wii Fit Studio. Striking Captain Falcon with Squall Hammer on Summit. Popo performing his forward smash on Kongo Falls. Performing their neutral aerial on Spirit Train. With Mario, Donkey Kong, Link, Samus, Pit, Villager and Inkling on Battlefield. One of the Ice Climber's preview pictures show them using Blizzard against a Metroid, referencing the species' weakness to cold in the Metroid series. The Ice Climbers, R.O.B., and Cloud are the only fighters that cannot receive a series bonus since they don't have any primary spirits from their own series. When the leader climber is grabbing and pummeling an opponent, the partner's animation will lag for every pummel hit. Hitting the accompanying Ice Climber (Nana by default) will not cause controllers to shake if the vibration setting is turned on. This applies for everything from normal attacks, throws, or Final Smashes. When played on the world map for World of Light, only the leading Ice Climber appears. If the partner is caught in a non-cutscene trapping Final Smash (e.g Triforce Slash, Great Aether, Omnislash) and the leader is KO'd, the partner will disappear, leaving the opponent attacking nothing. A similar situation occurs in Super Smash Bros. Brawl. There's an animation bug for the Ice Climbers where if they get sent into knockback hitstun by any attacks from behind, they will freeze for a brief moment before going into their tumbling animations. This was how knockback animations worked from Smash 64 to Brawl. When navigating the camera around the Ice Climbers during their certain animations such as their ledge hanging animations, the furry linings on the bottom of their coats and around their wrists seem to detach from their jacket, exposing multiple gaps. There's also gaps when looking at their face in certain angles between the furry lining. Additionally, zooming in on Popo's face reveals a gap between his hair and furry lining. Also, looking closely at Nana's hair reveals a small gap underneath between her hair and forehead. This page was last edited on April 18, 2019, at 19:11.